I put together a new vision board, something to daydream over. It was something I read about in one of Bob Proctor’s posts, after watching the movie The Secret, a few years ago. I was a bit put off by the movie, the first time. It seemed kind of New Age-y and I tend to stay away from that kind of stuff. But I watched it again, and it began to make sense: I could think new thoughts and take action on them. I tried it out, and it worked. I didn’t make millions, but coming from an abusive childhood, it was a big deal for me to get rid of an unjust bill by putting myself in a positive mindset and visualizing the solution before I picked up the phone. Slowly and surely, more good things came my way. Up to that point my life had been a cautionary tale: single mom, five kids, one with multiple disabilities, no money, working part-time freelance jobs. But then, opportunities began to unfold. And the more opportunities, I visualized the more they came into being. People started wondering what was going on. “You always seem so confident,” they told me. Inside, I knew I still had a long way to go. But I had been given some of the tools I needed, to go after what I wanted. Before I watched that movie, I didn’t even know how to ask for it. I started daydreaming in my first tiny 6 x 6 home office — a walk-in closet off the master bedroom. I had someone put in a window, and figured there was just enough room to wedge in a big, legal-size file cabinet and a four-foot folding table. That was where I started as a freelance writer. I desperately needed a space to work and that tiny closet became my refuge. I could get all the kids to bed and squeeze in an hour each night before I fell asleep. Maybe another hour in the morning, if I managed to sleep through the night without any flashbacks. The rest of the house was overrun with my five children and all the stuff that comes along with having children. As a single mom, most of my time and attention was focused on keeping them housed, clothed, fed and healthy. That was the goal. There was room, right in front of my table/desk for some cheerful posters. After watching The Secret, I assembled some magazine clippings, throwaways from the local library, and put up my first vision board. It became a habit to glance at it once or twice while I was working on a client’s blog or starting a new article. There, I’d posted pictures of things I loved and longed for: a beautiful new house, a garden with raised beds, bursting with fresh, healthy greens, beautiful plants, a quote from Mother Theresa about “giving yourself to God,” and lots of pictures of my children, because they’re the reason I do pretty much anything. They are some amazing human beings. Favorite pictures remind me how blessed I am to know them. Plus pictures of some outfits, a loving couple (because I didn’t want to remain single forever), stuff like that. A few years later, I’m happily married and living in a beautiful oversized colonial with a greenhouse and raised-bed gardens in the back, with plenty of room for my children (and now grandchildren) to come and visit, and I have indeed deepened my relationship with the Lord. Wow. I keep that old vision board to remind me dreams really do come true, with a little help. But this year, I put up a new one. This time, I went to Google images. 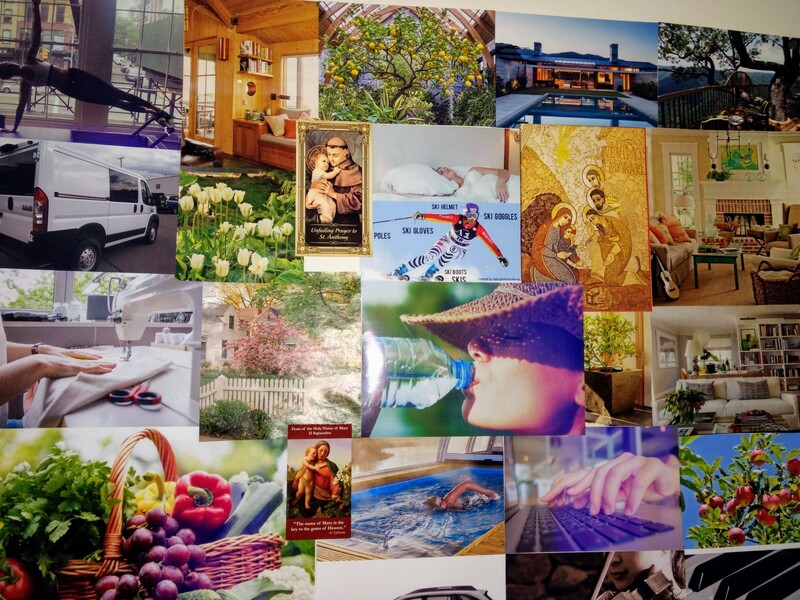 My new vision board is focused on: improving my skills as a writer and a musician, better networking, a new car, growing fruit trees, exercising, eating healthy, being there for my children, planning a new wardrobe, growing in my faith, etc. It’s about continually keeping my thoughts at a higher vibration to welcome new opportunities and enjoy the abundance that comes with trusting God and respecting the natural laws of thought. Even now, writing this, it still sounds a bit New Age-y. But I’ve come to realize these laws are based on the reality that abundance lies all around us, just as it did in the Garden of Eden. There are laws we are asked to follow. We don’t have to — we can keep on trying to do things the hard way — but natural laws are there to help, not hinder us. The choice is up to you. What pictures come to mind, when you see yourself, say 12 months from now? Two years? Where would you like to be? What would you enjoy seeing in your life? Time to relax and dream. I help people write books, by ghostwriting for them or coaching them through the writing/marketing process. Helping Creatives to Engage With the World, One Word At a Time.